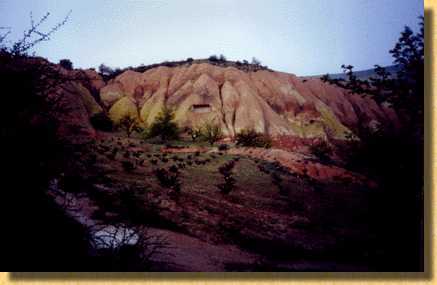 Red Valley is less than a mile from the center of Ortahisar. If you don't want to walk, you can always hitch a ride. People go there by car, motorcycle, and donkey every night of the year to watch the sunset up the road a bit; or to till one of the numerous small garden and vinyards that surround Red Valley. The views can't be described in a way to give justice to them, so here are some photos to give you a pale idea of the beauty I saw.